Top Ten Reasons to Breastfeed Your Baby! Find Delaware resources and get breastfeeding help instantly on your phone with﻿ LatchMe! ﻿The﻿﻿﻿﻿ ﻿﻿﻿Guide to Breastfeeding Resources in Delaware﻿﻿﻿﻿﻿ ﻿﻿lists﻿ various resources including hospitals, state programs, community-based organizations, private practice consultants, websites and classes that can support Delaware mothers in breastfeeding. La Leche League is an organization that helps mothers breastfeed through mother-to-mother support, encouragement, information, and education, and to promote a better understanding of breastfeeding as an important element in the healthy development of the baby and mother. Here are links to some of the great articles they provide and resources for providers, leaders, and parents. WomensHealth.gov offers online content tailored to the needs of women, with a broad range of fact sheets on women’s health topics, daily women’s health news, and information on government programs that focus on women’s health. 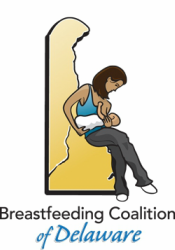 Be sure to explore this site for all that they have to offer on breastfeeding. low-income women, infants, & children up to age 5 who are at nutritional risk by providing nutritious foods to supplement diets, information on healthy eating, and referrals to health care. American College of Nurse Midwives: Questions and answers to help fathers who want to be more supportive of a breastfeeding partner. decision to breastfeed. The project is part of a continual effort to increase breastfeeding initiation and duration rates among African American women by involving fathers in breastfeeding promotion efforts. Family Education article : "Advantages of Breastfeeding to the Father and to Siblings"
One of the many benefits of breastfeeding is it requires very little tools. All you need is yourself, your baby, and a place in which to do it! Does your workplace have a clean, quiet place for women to breastfeed? What about your church or place of worship? Here are a few helpful links to get you started. Mothers everywhere are finding it possible to give their babies the important health benefits of breastfeeding even after they return to work. Here are some resources and information to help you make this important decision. The Business Case for Breastfeeding, provided by womenshealth.gov, offers guidance to employees on breastfeeding and working. Breastfeeding and Returning to Work Guide (English) (Spanish) offers information on what you need to know about returning to work while breastfeeding. Keeping Your Breast Pump Kit Clean has tips for ensuring that your baby gets the best milk possible, even while you are away. The National Women's Law Center provides information on the coverage of breastfeeding support, supplies, and counseling in the health care law and offer tools for women who encounter problems with coverage. Toolkit provides information on New Benefits for Breastfeeding Moms: Facts and tools to Understand Your Coverage under the health Care Law.